Dr. Goodman often receives letters and testimonials from patients whom he has helped through menopausal medicine, vulvovaginal aesthetic surgeries, or general peri-menopausal and sexual medicine. This letter is from a recent patient, sharing her life-changing experience with peri-menopausal treatment through Dr. Goodman. I am writing to express my gratitude for the exemplary care I have received from you. I feel as though we have a MD/patient relationship like those of the past: before the Government and insurance companies determined treatment by expense versus patient needs. You and your competent and caring staff have dramatically enhanced my quality of life. I am compelled to share my experience and hopefully prevent others from enduring the frustration I incurred. Years of being misdiagnosed, and therefore not properly treated, have resulted in extreme frustration, mistrust, wasted time and money. So I have chosen to simply tell my “story,” enabling you to utilize my opinion in whatever forum you choose. I encourage you to use any part[s] of this in any way you desire. happen to me is if I just didn’t wake up ever again. One of us clearly missed something. While in a position where the future was dreaded, my health was not a priority. I had already gone through five specialists from gastroenterologist to psychologist to no avail. It always resulted in adding another medication, invariably leading to a lecture from my original physician because the plethora of pills I consumed. I could not have cared less whatever my “problem” was called; I merely wanted to feel better without being a Zombie. I had finally reached the point of hopelessness. This was the third complete circuit with multiple physicians, and I tried all alternative measures available. I decided I was truly insane in that I repeated behaviors expecting different results and it never worked. I began having peri-menopause symptoms in my early forties. It was about the time I was reading Suzanne Summers’ book about “the change.” It was impossible not to relate to it; she was describing ME. However, I could not find a physician who agreed. Even the best OB/GYN in Texas ignored it because my FSH was normal and, therefore, I should not be having symptoms. In the next three years, I began to collect and read over ten books on perimenopause but could not find a MD who believed in any of it. The only one who seemed to treat peri-menopause was 300 miles away, had a six month waiting list and required much more money upfront than I had. I eventually quit reading as my knowledge was merely increasing my frustration. feel better. However, I just knew that there was something more. I recalled that all the books I had read were from California. I was on a quest again. Having been an RN for thirty years I believed I would be able to discern a good MD from a not so good one. But I found this was NOT true. AFTER I was treated by them, I investigated. In a thirty minute web search I discovered two of my MD’s had criminal records, lost their licenses in other states and had suspended licenses. access it via the California Board of Medical Examiners.) My first choice was Dr.
Dr. Goodman’s credentials impressed me, and I was hoping to find someone who had some experience in a practice relating to natural hormones. He had thirty years of experience in OB/GYN, so I knew he had seen the spectrum of the effects of hormones. At this time he was still attempting to work with insurance companies—my saving grace. I realized I owned one of the books he had written. I reread it and realized he shared my approach to health care. I so understood the exasperation of attempting to be a thorough, caring, competent provider of patient care when it seemed as though the entire health care industry was being attacked. I felt his frustration that the days of the unique DR/patient relationship was quickly fading away. The intro to the book convinced me I needed to get an appointment. I was so excited to see him I sent him forty pages of info in advance. I also literally made an outline so I could give him information succinctly and comprehensive. I primarily wanted to prove I was peri-menapausal. We ended up waiting an extra hour. To our amazement, he personally came and got us and was politely apologetic. Unfortunately, my plan to explain myself turned quickly to incoherent babbling. Dr. Goodman has the gift of being able to refocus the conversation. I was amazed how he was able evaluate my jargon and when I returned he reiterated my previous visit in about two very accurate sentences. things a bit after my previous health care casualties. Despite this, the office is comfortable and relaxing. He is very affable which adds to the casual nature of a rather formal office. By now, I was overwhelmed with the need to tell him my life story. His approach is very effective. He is organized and conscientious. He definitely works systematically in an interesting and successful manner. I left the first visit with only one prescription. He individually and methodically treats your primary complaint, consequently having a positive effect on other problems. In my situation, I had not slept well for five nights (10 hours total). This was my PMS every month. Within three or four days after seeing Dr. Goodman, I actually felt like I was on some sort of hormone high. I had previously been taking a rather dangerous dose and combination of pills to sleep—I felt in a fog, but I was still suffering from insomnia. Almost immediately, I experienced something new from this good doctor; I felt heard, understood, and believed I had found someone who had a similar perspective regarding medicine. The thing that clearly turned things around was: I had hope. I had never been to a doctor who considered my beliefs, priorities, finances, and time, making them an integral part in my plan of care. I had a two-and-a-half hour drive one-way to see Dr. Goodman, and he always kept that in mind, as well as the fact I was unemployed. He also utilized his strong medical background to keep the hormones balanced with any other health issues. I find him very conscientious when other specialties were involved. He made suggestions, but never contradicted another’s approach. sleeping meds. He is cautious, using only the lowest dosage needed and the fewest medications. He keeps close track of the medicines given for breakthrough symptoms. Dr. Goodman explained when “as-needed drugs” are being utilized frequently he desires to reevaluate your baseline treatment plan. He is very methodical and seems to only make one or two med changes, so it helps him keep a clear perspective. This enables him to have a much better chance in discerning med results or adverse reactions if you only have one medication treatment change. His warmth and kindness attribute to the ease in which I was able to communicate with him. While going through my history, I realized he had asked some very personal sexual questions related to a medicine I was taking and I did not even noticed it. His confidence and comfort in his profession enabled me to feel open to discuss anything with him. My entire life did not change overnight. It took a couple months. However within a couple of weeks I cared enough to want to be more proactive in my health. Dr. Goodman did not tell me what to do; he is more of a teacher. He gave me information and I chose to take many of his suggestions. I now feel as though I have much more control rather than all the PMS symptoms controlling me. I have lost a few pounds, joined the gym, took yoga classes, improved my diet, quit smoking, and no longer need the three blood pressure pills daily. But most of all, I am 48 years old and believe the best years are yet to come. Obviously, I would strongly encourage everyone to bypass the BS I went through. Make that first move and get an appointment with Dr. Goodman; you will simply be dumbfounded that you waited so long. We all have to make the journey through “middle age,” but it doesn’t have to be so rough. Once again, I share a sincere thank you to all of those at Caring for Women Wellness Center. I am blessed to have found you. My husband concurs; he no longer has to worry about being pulled into the dark hole with me. 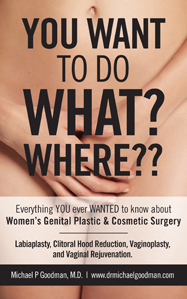 For more information on a wide range of topics from menopausal medicine to general health and wellness to the specific topic of labiaplasty in California, visit http://www.drmichaelgoodman.com/.